Do you the tower crane? Do you want to know the tower crane how to use in China? 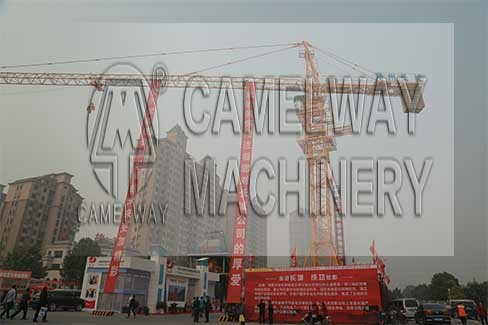 Camelway Machinery manufacture will give you a new introduction about the tower crane. As we know, the crane is a type of machine, generally equipped with a wire rope, hoist rope and sheaves, that can be used both to lift and lower materials and to move them horizontally. It is mainly used for lifting heavy things and transporting them to other places. The tower crane uses one or more simple machines to create mechanical advantage so that it can move loads beyond the normal capability of a human. Our company develops and produces tower cranes and mobile construction cranes which satisfy many different requirements. Our cranes are commonly used in the transport industry for the loading and unloading of freight, in the constuction industry for the movement of materials and in the manufacturing industry for the assembling of heavy equipment. There are many different cranes in our company. According to the presence, it can be divided into mobile tower crane and fixed crane traveling mechanism. According to the structure of the actuating arm, it can be divided into movable arm and horizontal tower crane arm. According to the tower structure under the rotary mode can be divided into rotary (tower) and rotary tower crane (the towers are not rotating). Our cranes specially adapted to customers’ requirements are produced in every market region.Camelway Machinery manufacture develops and produces tower cranes which will satisfy your different requirements. The company also provides project consulting services, for example for power station and plant construction or the construction elevators. We will try our best to service for you and build win-win business with you. Welcome to contact with us. This entry was posted in Solution and tagged Tower Crane by camelway. Bookmark the permalink. How to select mixing console to achieve a desired production efficiency?